Dieser Beitrag wurde unter Workout Of The Day abgelegt am 31. März 2016 von cfbs. Dieser Beitrag wurde unter Workout Of The Day abgelegt am 30. März 2016 von cfbs. Yes, that’s how bad it was. I can still hardly type, as my triceps are screaming. When I woke up Friday early in the morning to check out what came out of Dave’s mind for 16.5, I was a little bit disappointed: Repeat 14.5. Burpees AGAIN. But it’s still one of my favourite Open WODs because there is no timecap and its a grueling one. Mentally very tough, Thrusters and Burpees, most people hate them. And back in 2014 when this WOD first came up, there was not even a scaled option, so some people really fought forever to get the WOD done. This is also the beauty of CrossFit, it is for sure not easy and it teaches you a lesson every now and then. Kudos also to the many people at our box and around the globe for going rx’d in this WOD. Special mention to Gee-Jay (34:10), Tamara Lutz (28:59) and Dora Seebacher for not going scaled. Dora was our oldest competitor (sorry, usually I try to avoid talking about a lady’s age) this year (rx’d Masters 55-59 18:36). The internet is now full of people complaining, the Opens have been too light and to easy, despite having a scaled version now. I say it again, in my opionion, the scaled version is to down scale, so more people can do the opens (rasining registration numbers confirm this believe). It’s not meant to have scaled as the old rx’d and therefor make the rx’d heavier than what it was in the past. There were new movements introduced with the lunge and the bar muscle-up. Other than that no suprises about the exercises. Also no surprises about the length of the Open WODs. All pretty normal. The Opens have always been a lot of reps and therefor a lot of Cardio. Many potentially good Regionals Athletes will not make it past the Open, because the light WODs with a lot of reps are a weakness. After the Open you should also take a moment and sit down, think about where YOUR weaknesses are. The Opens are fantastic for me as a coach. There is thousands of data points and as you rank against other people, you can see very clear, where you are strong, or weak, compared to your peers. It has been a fantastic five weeks with downs and ups. We missed our goal to qualify for regionals as a team, but we will continue to work hard and try it again. There have been some new(er) athletes in our team with strong performances and we will help them grow further. In the meanwhile you will see our competitors potentially at some minor european competitions during the year (Regionals is still THE major competition). BUT, we definitely reached our main goal, strenghtening the community within CrossFit Basel and CrossFit Basel Downtown. It has been amazing to see how you guys connected, cheered and helped each other. With at outstanding number of 104 registered athletes almost every 5th member competed in the Opens. As I Coach I am very proud of everybody’s achievements! You pushed yourself very hard and many of you learned new skills, performed stronger than expected. This is the magic of a competitive community. We fight together, struggle together and then share the rewards together. Congratulations to Captain Döne and Team The Bomb Squad, you guys won our first internal CrossFit Basel Open! Thank you Alessia for takeing care about the organisation and communication of the heats every week. Thank you Oli Franklin for being our Headjudge in most of the Heats. Thank you Team Captains for leading your teams. Thank you Gabriel Gee-Jay Jenny for your media support throughout the Opens. And thank you everybody for competing along my side in the Open 2016, it has been a pleasure! The final team leaderboard will be available mid April. In the past, our team jumped up about ten places in the ranking after the individual competitors were sorted out from their teams. The following leaderboard is just provisionally. Consistent performance, despite falling back to rank 58. Check out this page for an official analysis from the games site. Alessia is the third best female CrossFitter in Switzerland, great Job congrats! With Jessi, Katrin, Pascale and Aline we have four more girls in the swiss top 20! Me and Tom rank in the top 30 (Joel also, if he had put in a score for 16.4 😉 ). Jona in the top 50. CF Turicum will most likely be the only german speaking Box with a team at Regionals (they have two individuals who will potentially go individual, their scores will not count anymore towards the team). Myleo from Berlin and also CF Munich performed strong but are too far out of the top 20. Our team has undergone a change again since last year. Our best male competitor declined injured and on the girls side there were also different athletes scoring. This means two things. First it is another proof we are doing a great job to bring up new athletes. Second, life happens and its hard to perform well and build up over years. Either we grow with the nordic competition or we hope for a split of Europe into two Regions. Kidding, of course Europe should be splitted, because it was by far the strongest region. But on the other hand, the south just has to work harder, including us. Enough said. The spirit points go to Downtown Outlaws, they did a great job spamming the CrossFit Basel Facebook group with sloth dominance on Friday night heating up for Saturday’s final WOD. Nicole and the WOD-nit Team went out for playing Lazer Tag, they get the team bonding points. Team WOD-nit also came up with some borderline banter when they played with the other teams mascots. They later apologized and if they are not doing it again, all teams will love each other until the end of all days. Congratulations Nicole for your performance. Second best in Switzerland and among the best in Europe in your Masters category. I have the utmost respect how hard you worked your way back from injuries, keep up the good work! Dieser Beitrag wurde am 30. März 2016 von cfbs in Allgemein, CrossFit, Events veröffentlicht. Schlagworte: 16.5, Competition, CrossFit Basel, CrossFit Games Open, WOD. Dieser Beitrag wurde unter Workout Of The Day abgelegt am 29. März 2016 von cfbs. Dieser Beitrag wurde unter Workout Of The Day abgelegt am 28. März 2016 von cfbs. Dieser Beitrag wurde unter Workout Of The Day abgelegt am 27. März 2016 von cfbs. Dieser Beitrag wurde unter Workout Of The Day abgelegt am 25. März 2016 von cfbs. Dieser Beitrag wurde unter Workout Of The Day abgelegt am 24. März 2016 von cfbs. What a nice Chipper. 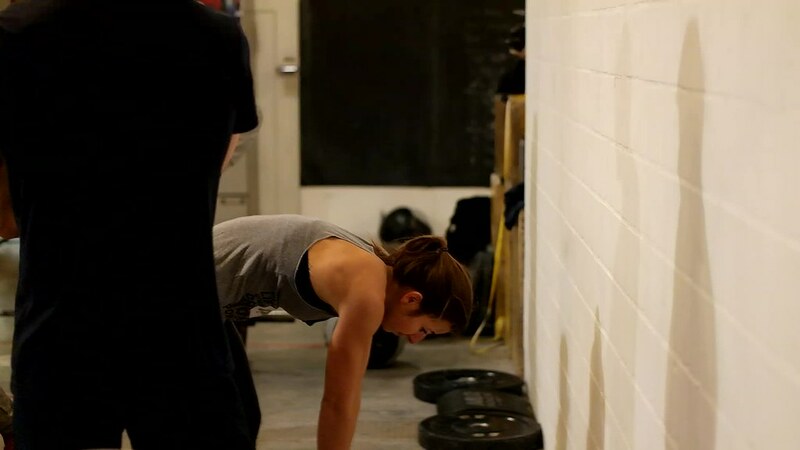 The Deadlift will fatique your rowing. The Wall Balls will fatique your Handstand Push-ups. Where this is a great opportunity for people going rx’d even when they are struggling with certain skills or gymnastics, for the higher level athletes this one really came down on how well you perform at Handstand Push-ups. I said it last year and I will repeat it again. Some people are born to do Handstand Push-ups and others aren’t. Leverage makes a huge difference (and so did various interpretations on standards, but let’s not elaborate on that…). Our team peformed very consistent with an outstanding performance of Alessia Wälchli, she is the female top scorer in Switzerland. Congratulations! We have still 5 Girls in the top 20 of Switzerland. Consistent performance, we are still sitting in 56 place. Official analysis from the games site. The spirit points go to Döne and Team Bomb Squad, they met sunday morning for a team brunch and to Andi and Team Bully Buddies for going to another dinner on Saturday night. Lorenz and Team Downtown Outlaws went out for some drinks last Thursday, they get their Team bonding points. Awesome work guys! I got already so much positive feedback about the internal Open and it’s also a lot of fun for us to see you performing so well in the workouts. Dieser Beitrag wurde am 23. März 2016 von cfbs in Allgemein, CrossFit, Events veröffentlicht. Schlagworte: 16.4, Competition, CrossFit Basel, CrossFit Games Open, WOD. Dieser Beitrag wurde unter Workout Of The Day abgelegt am 23. März 2016 von cfbs.